Steal a life from a buddy, he doesn’t need it. Let Player 1 ( Main Account ) die and when he runs out of lives, Press + to steal a life from Player 2 and you’ll get the Trophy. Well….. Just finish the game on single player mode, Don’t play on Wussy difficulty, WHY? Because you’ll be a Wussy if you did ……… Nah just kidding, Finish the game on any difficulty but the game is hard so play on ..Wussy. – Whose Mine is it Anyway? NOTE: Finishing the game on Co-op will NOT unlock this Trophy. 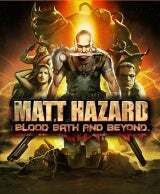 MHGB ( Matt Hazard Game Boxes ) are collectibles in the game, Each mission has 3 MHGB, Just keep killing every enemy you see and destroy every box you see, Its a 2D game, How hard can it be to find them. You have to complete the game on Co-op, 2 controllers are required to play Co-op because there is no Online in this game. If you don’t have anyone to play with, You can just let Player 2 die until his out of the game and complete the game like your playing alone. You have to get a score of 500,000 which is alot so this has to be done in a Whole playthrough. Mission one is the easiest and you can get more then 100,000 point so try your best in it. These…Pachinko Coins are collectibles in the game, They look like large coins with the letter P in it, You can find them by killing enemies or destroying boxes, So make sure you kill Every Single Enemy in the area. I not sure but i think all the each mission has 10 coins. This one is a bit hard but you will get it in a few trys, You will fly this ship in mission 7 or you can unlock it after completing the story but i recommend playing it in mission 7. So… You have to be very carefully when flying, Do not get shot, Do not go off the screen for 10 secs and do not crash, Fly slowly at the middle of the screen and do not use to much gas except of you have to dodge something. When you reach the landing pad, Take your time to land perfectly, Make sure when you hit the pad, You msec is 0. Complete ‘Oh. Canada’ in 12 minutes. You must complete mission 3 in lest then 12 minutes. Just keep going, don’t worry about the enemies or your lives and when you reach the boss, Just throw all the grenades you have then die and you’ll get your grenades back so throw then again…and again…and again. Defeat “Old Berney” without losing a life. Old Berney is the boss of mission 2, You must defeat him WITH OUT DIYING. This is not very hard it just need many trys but the problem is if you die, You have to play the mission all over again. Make sure to save your shield and use it just before you die. Part 1: He will throw an anchor on you , To dodge it just keep runing until it crashes on the ship, then keep attacking it but becareful, Enemies will come from the left and the right when he throw the anchor. Part 2: In this part he will shoot missiles, They move slowly from above, Just shoot them and they will go back to him. But again… becareful, Enemies will come from the left and the right. Part 3: This is the hardest part, Its same as Part 2 but he has one more attack, He will use his light to blind you and your controller will become oposite and will shot balls ( IDK what they are called ) over you, So press to attack above and try to shoot them to destroy them. And again…….becareful, Enemies will come from the left and the right. Complete “The Hate Boat” without using a continue. Do this on Wussy difficulty, What you need to do is completing mission 1 with out useing a continue so try not to die alot and save some lives for the boss. This mission is long but it has many enemies, So kill everything you see to get extra lives. -Good place to hit the boss. -Good place to hit the missiles.